Rev. 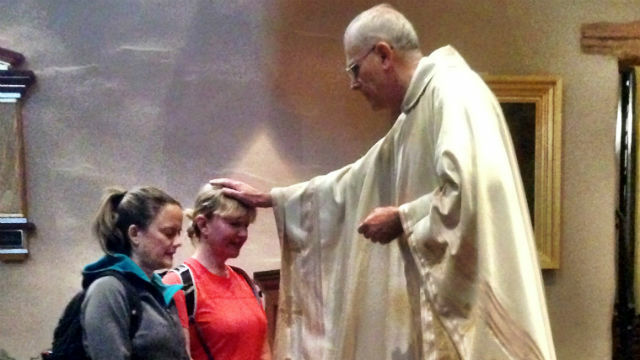 Bill Springer blesses Maggie Espinosa (left) and Tracey Elliott in Mission San Diego de Alcala. “In the name of the Father, Son and Holy Spirit, amen” were the priest’s final words of blessing for me before I embarked from the Mission San Diego de Alcala to walk 800 miles along El Camino Real, visiting California’s 21 missions. I wasn’t soul searching. I’m not an endurance athlete. I’m an ordinary 54-year-old woman. Why, then, did I take on such an endeavor? Perhaps the answer would come with the steps. Do I believe in God? Yes. Do I pray? Yup. But, that’s not what this was about. I love to set goals and meet them. It’s part of who I am. It springs from my younger years when I didn’t complete a few major tasks, which I regret. I didn’t know how much this lofty ambition would push me to my limit. I divided my peregrination into 12 months, taking four days each month to cover approximately 75 miles, with Amtrak as my chauffeur to and fro. Google maps and “A Hiker’s Guide to California’s 21 Spanish Missions” were my compass. Before launch, I sent an email inviting friends and family to join me on any segment of the excursion. A surprising number said yes. Maggie Espinosa hikes through strawberry fields in Oxnard. My buddy, Tracey Elliott, signed up for the first leg in November 2013, from San Diego to San Juan Capistrano. After two days and 45 miles of winding through Kearny Mesa, Torrey Pines and Cardiff, we entered Oceanside’s Mission San Luis Rey. “You’re mission walkers,” exclaimed a church volunteer as we ambled into the chapel, laden with our backpacks. Unbeknown to us, we were rock stars in the ecumenical world. Fueled with false bravado, we continued north to our destination. During the remaining 20-plus-mile days, life stories were regaled, jaw-dropping sunsets witnessed and thousands of laughs shared. This was the blueprint each month. My fellow pilgrims were from all walks of life, ages, professions and religious beliefs, brought together by California’s Royal Road. With another friend, Cindy Freeman, I pounded L.A.’s concrete jungle along parts of Route 66 to the San Fernando Mission, all the while marveling at how two old broads exhibited such endurance. Compadre Roxanne Hayes and I hugged a 12-inch-wide shoulder as we trampled roadside brush over Lompoc’s Harris Grade, yelling “car” when we’d hear the engines’ roar around the curves. And fond family memories were forged as my 11- and 28-year-old nephews strolled Monterey’s breathtaking beach alongside their “Aunt Mag” on the way to Mission Santa Cruz. As the miles accumulated, I crossed the line from weekend warrior to athlete. Hiking paraphernalia segued from stylish to necessary accouterments. Arduous days of stop-and-go to massage my aching feet were not uncommon. More than once, I acquiesced and traded my sneakers for slippers. Vanity disappears under the brutal enormity of walking consecutive eight-hour days. Along the way, my companions and I expected sore bodies and pep talks when fatigue commandeered our fervor. What we didn’t expect was the kindness of strangers. The California Mission Walkers (CMW), a group of El Camino Real enthusiasts, followed my escapades on Facebook. Having never met any members, I was astonished when affiliates asked to walk with me, and with nothing more than an email to acquaint us, graciously provided guest rooms and meals to my cadre. A few months into the walk, my father passed away in Florida from a stroke. The following weeks were dedicated to processing the loss, planning his memorial and flying east to lay him to rest. With a heavy heart, I reluctantly resumed my walk in May. I needed to cover twice as much ground to make up for lost mileage. As I fought off tears, I asked myself, “What was keeping me going?” Sheer will prompted me to put one foot in front of the other. I thought about the time when I phoned Dad to tell him I was walking past a field of our favorite vegetable — artichokes. He had chuckled. In subsequent months, CMW members, family and friends continued to traverse the King’s Highway with me, softening the loss. We geocached through the redwoods, dined overlooking Morro Rock, toured Salinas’ John Steinbeck Museum, toddled across the Golden Gate Bridge and attended Mass at San Carlos Borromeo de Carmelo Mission, where Junipero Serra, the founder of numerous missions, is buried. By fall, I started to feel fatigue. Freeman, who walked with me in January and then again in October, said she could see this journey had taken a toll on me physically and mentally. I wanted to believe this wasn’t true, but she was correct. I could feel my pace slowing and my zeal waning about completing an ultramarathon every three weeks. However, I still wanted to put on a good face for those who only experienced a small fraction of this walk. I rounded the last corner to the final mission on Nov. 5, 2014, with my husband by my side. Tears streamed from my eyes as a year’s worth of emotions surfaced. I’d accomplished a daunting goal — the 11th person to complete this sojourn. I wanted to call my Dad to say “I finished.” Perhaps he knew. I learned so much on this odyssey. Relationships are the heartbeat of life. There is a reserve deep inside everyone when called upon. Humanity is good. Maggie Espinosa is a San Diego-based freelance travel writer. Her website is TravelWithMaggie.com.